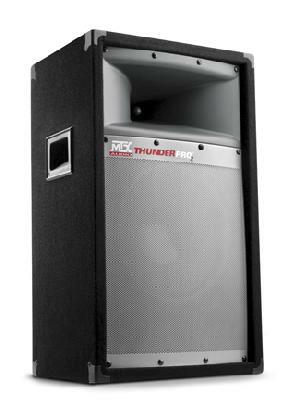 Designed for mobile DJs, musicians, and loud music fans everywhere, MTX Audio offers the ThunderPro 2 Series of professional loudspeakers. Built to last with a stainless steel grille and MDF box covered with aviation grade carpet, the ThunderPro 2 speakers have an X-radial design, horn-loaded tweeter for crisper highs paired with the high excursion ported woofer configurations for better low frequency response. Mobility and setup are an ease with a lightweight design and easy grip handles. Reinforced and interlocking corner supports protect during moving and allow cabinets to be stacked when bigger sound is needed. With a smaller size than other pro speaker lines, the ThunderPro 2 speakers have a long throw and wide dispersion. Single woofer models can also be pole-mounted to raise the sound stage to ear level. Regular Price - $128.00 ea.